I've been knitting again! I started this sweater during new years and finally finished it this past week. 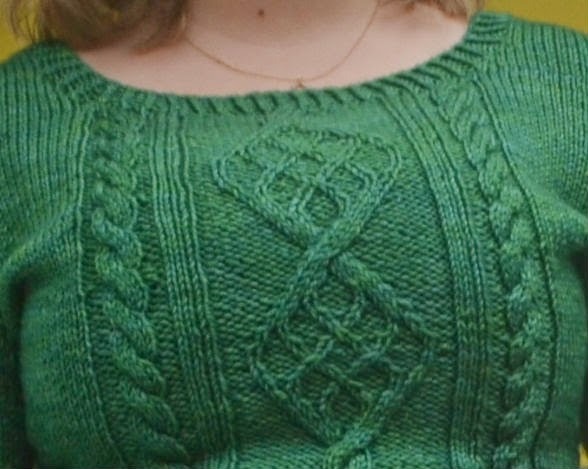 It's a top down seamless pullover from Untangling Knots. The directions are clear and well thought out, lots of short row shaping to fit the body. I made the size L, and it fits pretty well. It was nice to work in a worsted weight yarn, usually I pick out a pattern for something with size two needles and it takes an eternity to get anywhere. 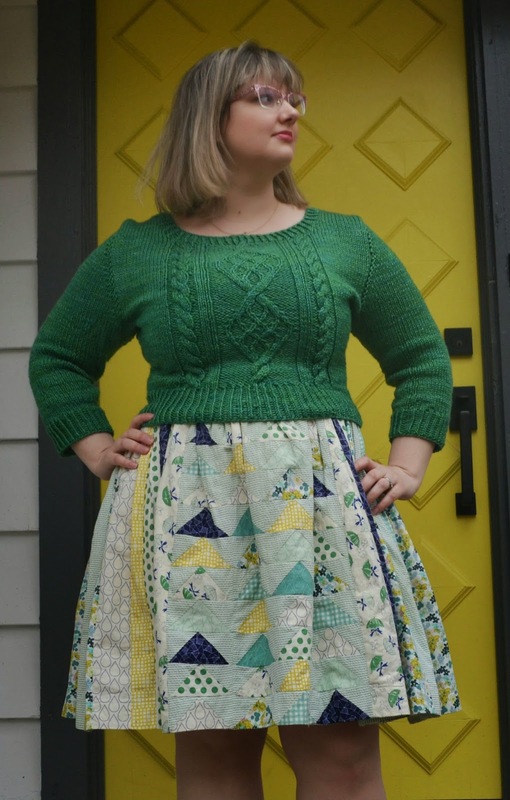 I'm wearing the sweater over one of my favorite makes, my quilt dress. The green is a gorgeous spring color, I have to make some more things to go with it! The yarn is Holiday Yarns Wooly Ewe Worsted, from a local yarn store Knit A Bit. I love Andi's patterns, I've already made the Miette, and I just casted on the Marion, also in a worsted yarn. It's a pink yarn to match my new glasses, Kate Spade Lyssa in a pink sparkle! I'm in love. 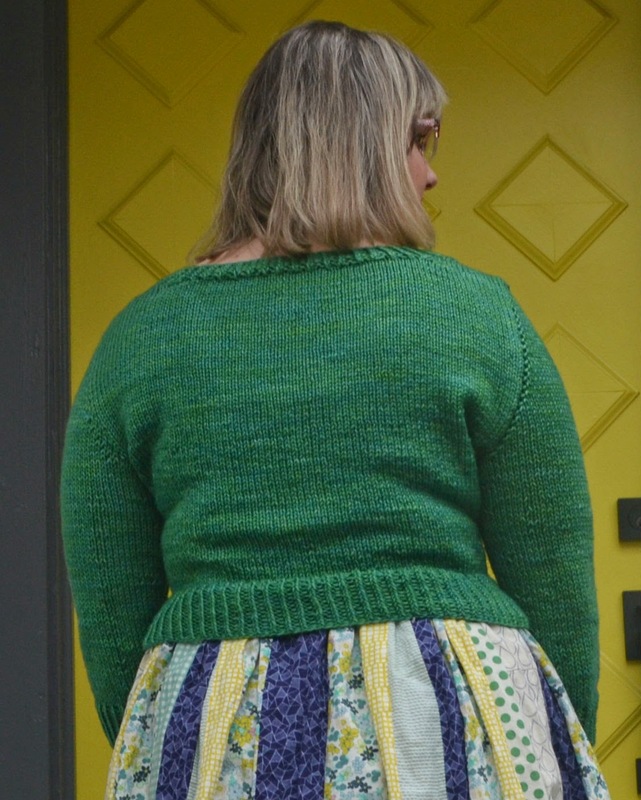 Carolyn Pajamas: This Time in a Knit! 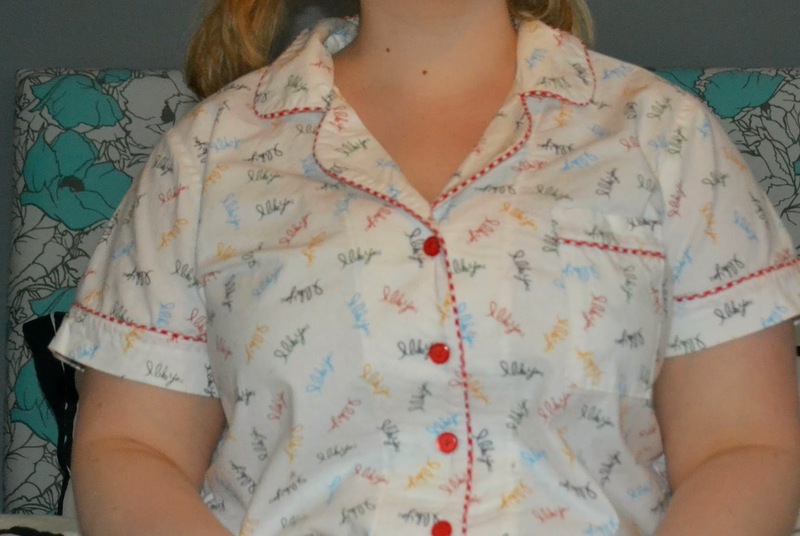 I'm back with my second pair of Carolyn Pajamas, fresh off the sewing machine! And I love these ones even more. I was inspired to use a knit, like my favorite pair of pj's from BedHead. They are so soft and combine some of my favorite things. Jammies (obv), flamingos, and America. 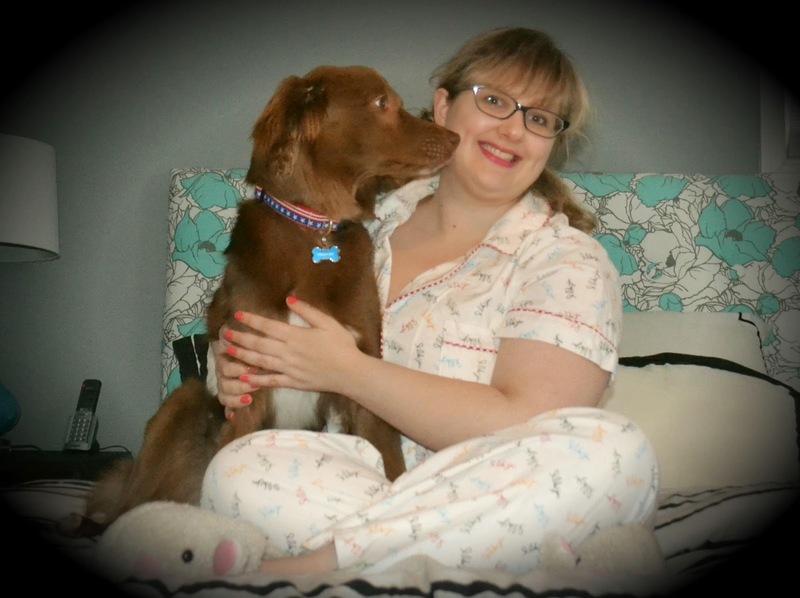 These pjs are made in the USA, so if you don't feel like making your own I highly recommend them. I used a knit fabric that I've been ogling at work, it's from Art Gallery Fabrics, cotton knit with a bit of spandex in it. SO SOFT, and perfect for jam jams. I used a piping that kind of looks like a cord, in the marigold color with matching buttons. The piping was easy to put in, not any different than applying it with a woven fabric. I was planning on adding the cuff to the pants, but they were already the correct length so I just went with it. I used the serger to sew my seams, but all the top stitching was sewn with the machine, straight stitch, and a knit needle. I hemmed the pants and the top with a double needle. I also sewed the facings to the fronts, it's like that with my flamingo pjs. I was worried that it might not work in the knit, but it went together super easy. I can see myself making many more pairs of these pjs. My favorite time of day, is when its FINALLY time to put pajamas on and go to bed. I love love love pajamas. 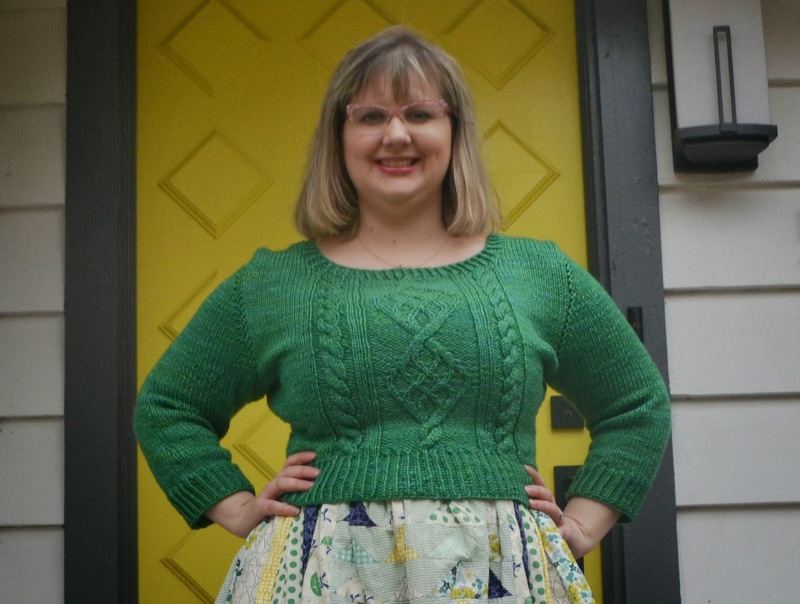 I was so excited when the Carolyn Pajama pattern by Closet Case Files came out. A full set of pjs, that is cut in a modern way. 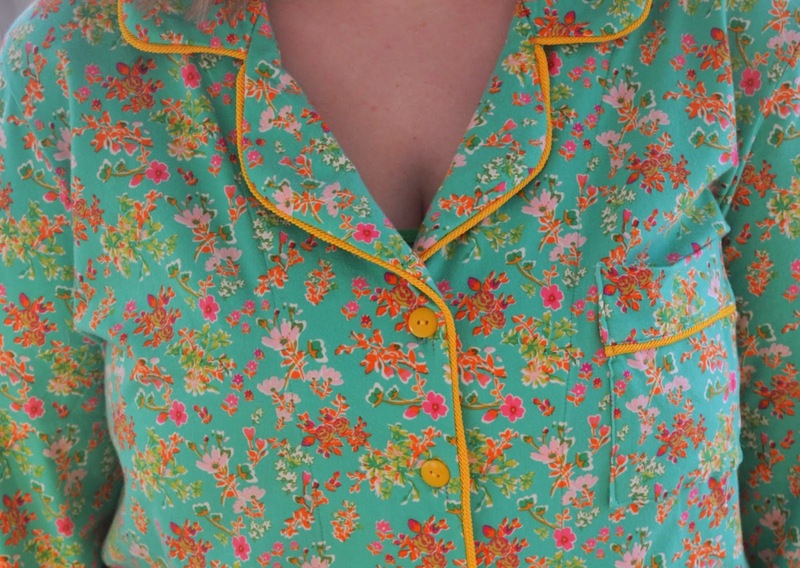 There are plenty of big 4 pattern pjs out there but I've attempted to make them and they are always huge and frumpy. I knew this pattern wouldn't be. I made these pj bottoms over a year ago, and attempted to make a top to match with a big four pattern. The result was frumptastic and huge and I never finished the top. 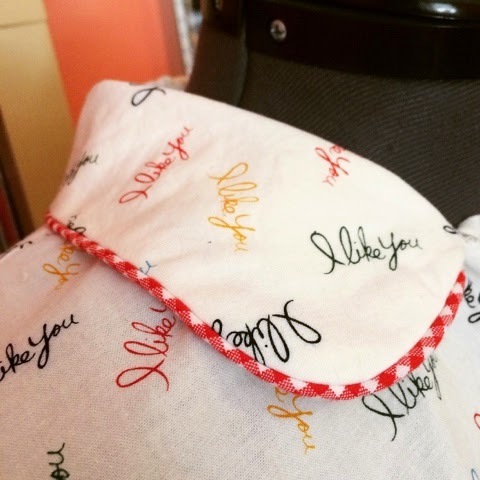 I bought more of the fabric, the Amy Sedaris for Windham Collection "I Like You" and waited for an appropriate pattern. SO happy with the results. The directions are straight forward and easy. I made my own gingham piping, using rat tail as the cord. The only adjustment I made was to make the short sleeves bigger for my muscles/ chunk arms. After wearing my pjs for a couple nights I stitched the facing to the shirt. This is how my rtw pj shirts are and it is more comfortable. I love this pattern so much I am spending this snow day making a pair out of knit, and wearing my I like you jammies. Total jammie bliss.